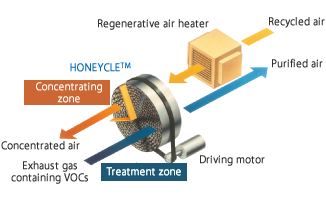 NICHIAS have developed “HONEYCLETM” filters that are able to be used for many applications today from absorption of harmful VOCs in industrial effluent gas treatment plants to moisture in dehumidification applications. In VOC (Volatile Organic Compound) absorption applications, HONEYCLETM has diameters from approximately 1 to 4 meters and has numerous honeycomb-structured holes on its surface. They act as filters that absorb harmful VOCs (Volatile Organic Compounds) which can be emitted as process effluent from factories and other facilities, eg. Factories using large volume of paints, print ink, adhesives and thinners. Such VOCs evaporate in the atmosphere and become gases, which react with sunlight (ultraviolet rays) creating photochemical smog. In recent years, both the public and private sectors have been promoting measures to control VOC emissions, and our HONEYCLETM is performing well as a part of such measures. VOCs are absorbed by HONEYCLETM and clean air is sent out to the atmosphere, and a concentrating zone, where VOCs attached to HONEYCLETM are released and collected by treating with heated air. HONEYCLETM rotates as slow as 4 to 10 rotations per hour and moves through the two units alternately, which allows uninterrupted use while maintaining high-purification performance. Today HONEYCLETM technology is extensively used in Japan, and is increasingly being considered the technology of choice across other markets in Asia and Europe.